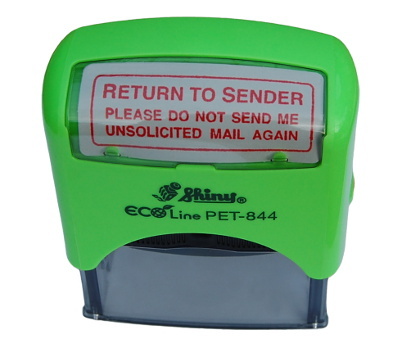 This stamper makes returning unwanted addressed junk mail to the sender a doddle; just cross out your name and address, put one or more stamps on the envelope, and you're done. I've reduced the price of the stampers from £7.50 to £4. That's roughly the cost price of the item. When you return unwanted junk mail to the sender you should always cross out your name and address. The stamp is reasonably large and easy enough to understand for human beings – but Royal Mail's sorting machines won't understand that the item should go back to where it came from. If you don't cross out your name and address the machine may redirect the item to you again. Similarly, it's a good idea to always put a cross through any red / orange sorting stripes on envelopes. Making the codes illegible for sorting machines will make sure the item goes back to the sender (and not to you!). Finally, please be aware that not all senders will respect your wishes! Decent junk mailers will take your details off their junk mail list, while others may need a couple of returns. Unfortunately, there are also senders who routinely ignore any junk mail that's returned to them. My advice is to send them a so-called data protection notice – this will force them to listen. More information about returning junk mail to senders can be found on the Return to sender page in the Guide to Stamping Out Junk Mail.